Finding a good JRPG to play nowadays isn’t as easy as one would imagine. Although there’s no drought of games to dive into, it’s still relatively hard to find a franchise to stick to. Especially one that consistently puts out quality entries, games that are not only fun, but also give enough reason to keep you faithfully playing for years. Ys is one such example, a series that has been rolling for just about three decades, even though it’s not as entry-heavy as say, Final Fantasy, with around eleven or so games released over the years. Without taking into account the latest Ys game that was just put out, Ys: Memories of Celceta, which is a remake of Ys IV, a Super Famicom game from the early 1990s, Ys VIII: Lacrimosa of Dana is the latest proper entry in the franchise, and one heck of an action JRPG. What sets it apart from previous releases is that it does away with the traditional isometric view angle in favor of fully 3D navigation while keeping the same deceptively simple combat gameplay that made the few entries that I’ve played over the years so entertaining. Lacrimosa of Dana opens with series’ protagonist Adol and his pal Dogi aboard a ship on their way to their next adventure. Things don’t really work out their way, though, because they eventually find themselves shipwrecked on an island that’s apparently haunted after their vessel gets attacked by a huge sea monster. 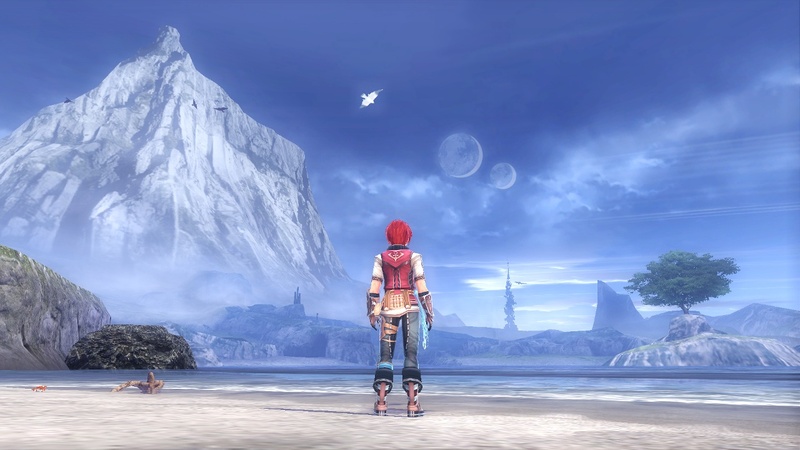 After waking up alone on a deserted shore, Adol eventually runs into fellow castaways, and finding the rest of the survivors becomes the thrust that carries Ys VIII’s story, as well as finding out just how dangerous their new (and that they hope is temporary) home really is. As you can probably guess, there’ll be plenty of exploring ahead of you when playing a game set on a seemingly uncharted island, and you’d be right when it comes to Lacrimosa of Dana. Part of the overall goal to it is putting together a map of the whole thing, and believe me, it’s a vast piece of land. Luckily, the entire thing isn’t open to exploration straight away, but there’s enough of it that makes the game feel like a relatively modest open world experience, in the sense that you can take a few different turns than what the current goal might be pointing you towards and possibly get into more trouble than you can handle. While Ys VIII’s world isn’t as dangerous in that regard as Final Fantasy XII’s, which literally put a monster that was dozens of levels stronger than your party right outside the starting town, ‘Dana doesn’t pull any punches. 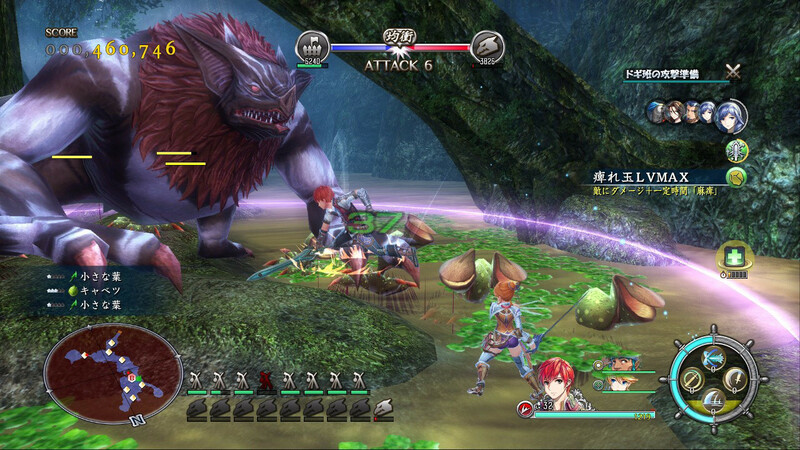 Early Ys games took a more primitive approach when it came to combat, and had Adol run into enemies with his sword constantly set in front of his body, poking them as he walked around the field. Later games, especially the ones that were remade, namely the previously mentioned Memories of Celceta and Oath of Felghana, out of the ones that I’ve played a bit of so far) eventually evolved the gameplay to something more action-y, having you press buttons to perform attacks as you moved Adol and tried to avoid incoming attacks. 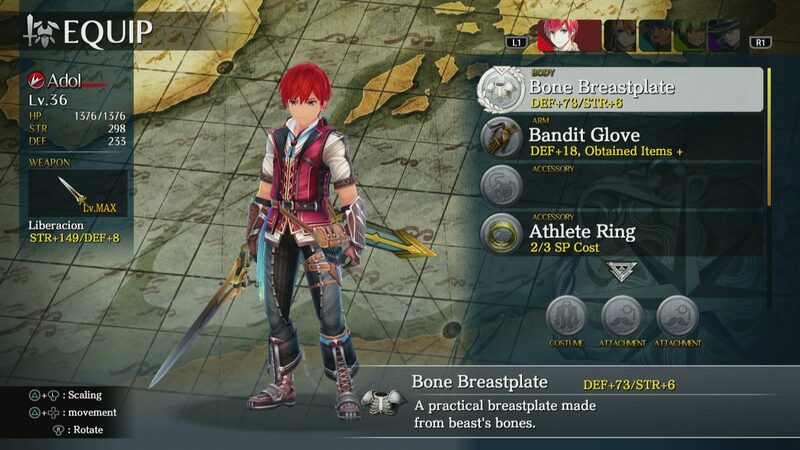 Ys VIII is a further evolution of that, as it gives you a party with which you can switch around computer controlled characters on the fly, each with their own equipment sets and particular strengths that come into play when facing enemy weaknesses. The closest comparison I can make that I’ve recently played is Tales of Berseria, in the way that it has you directly control characters and map attacks to your controller’s face buttons, but unlike that game, ‘Lacrimosa doesn’t rely on combos during combat, instead, you focus on attacking those weaknesses that I mentioned and from there, whale on the poor bastards until they’re done for. Thanks to that, fights are usually pretty quick to get through, which is a good thing, because there’s a lot of it throughout the game, as you run around from quest point to quest point, in real time, without transitions, with the exception of boss fights. I would be remiss to say that Lacrimosa of Dana’s story is incredible in any way, and there are plot points that you can see coming from a mile away, but I have to admit that I’ve come to like the main cast a whole lot. Even though Adol is a silent protagonist and you only pick a dialog option here and there in order to keep things moving along, the rest of the characters you meet are pretty well developed, all things considered. 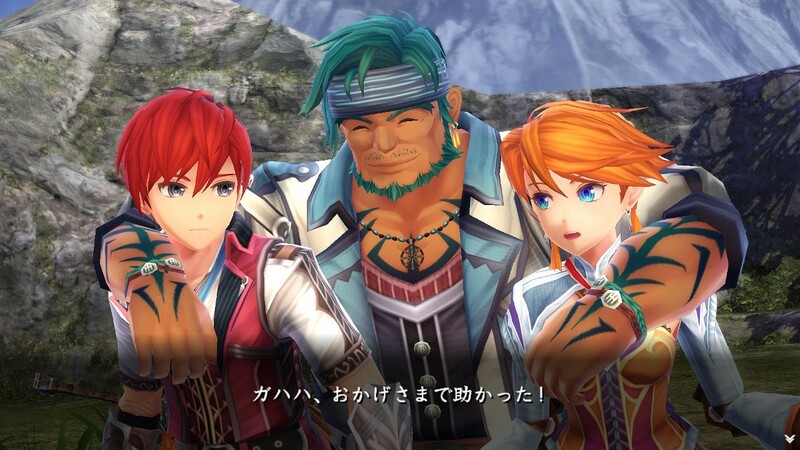 There’s the classic case of a aristocratic girl put into a situation she’s not at all used to, the sailor who just happens to be sickly afraid of monsters, but is fiercely loyal, and of course, Ys VIII wouldn’t be a Japanese RPG without a mysterious and ridiculously dressed stranger who’s curt and has an edgy attitude. And somehow, every one of these guys (and others that you meet) eventually grow out of their shells in interesting ways. Sure, there are a few that don’t go anywhere particularly interesting or are plain dumb, but they’re thankfully just exceptions to the rule. Aside from the main story, there’s a number of side activities you can partake in, like the aforementioned charting expedition, as well as fishing, hunting and even gathering items that can be used to craft a number of upgrades, both to your party’s gear and for the castaway village that you slowly build up and upgrade over the course of the game. Speaking of village, you’ll also have to defend it from monster attacks from time to time, so you’ll also be spending resources building and upgrading defenses in order to have an easier time fighting during the raids that pop up from time to time. It’s a good thing that the map that you put together includes fast travel points, because you’ll be using them a lot as you pop back to the settlement for those fights instead of huffing it back and forth. Picking up from the little bit of exploration of the island that I talked about before, it’s worth noting that even that part of the game offers its share of progression. You’ll occasionally run across spots that you can’t access right away, and in true ‘platforming sub-genre that should go unnamed’, you eventually pick up items that can be equipped in order to allow you to traverse these obstacles. Annoyingly, though, these nicknacks can’t all be worn simultaneously, so you’re forced to go into a special menu in order to equip them each time you wish to for example, climb a vine. It’s somewhat of a baffling design decision, but these sections are so far in between that I haven’t had as bad of a time switching out, it’s just not convenient. This is probably one of the best looking JRPGs I’ve played in a while out of the ones that try to emulate an anime style to its characters and creatures. The colorful cast animate quite well, and for all the gripes I may have about wardrobe choices for a few of them, they all look the part and could very well have come out of an animation you’d be caught watching on Crunchyroll or the whatnot. In the same vein, the English voice acting is just as good as any you’d expect to hear in dubbed animation, read: serviceable, but ultimately bland. I quickly switched to the Japanese voices after the opening section and haven’t looked back. There was also a whole kerfuffle over the script to the game being terribly localized, but having played the patched and revised PC version of the game that came out a few months after the console versions, and I haven’t run into any weird linguistic issues whatsoever. Ys VIII: Lacrimosa of Dana is simply put one of the most enjoyable JRPGs that I’ve played in a while. There’s a whole lot to do, and while most of it might simply be considered busy work for the sake of pumping up playing time, it’s extremely worthwhile to dabble into it all in order to reach the game’s best ending, as well as to see where all of the sub-stories go. Thanks to a strong cast and a decent enough story, Ys VIII is a game that I want to see through to the very end, and better yet, it gives me even more reason to dig back into the Ys franchise, as well as keep me anxious to see whatever’s next for Adol and his friends.